Every good machinist knows you need all the options you can get to tackle difficult engineering challenges. From varying diameters; stub, regular, long & extra-long lengths, to square end; corner radius & ball ends options, there is a Conical Tapered Carbide end mill. The three and four flute designs facilitate excellent chip evacuation and maximize flute engagement for an improved finish every time. Our tapered end mills are the standard bearer of the industry and come in thousands of configurations. Workpiece geometries are continuing to become considerably more complex, with pricing that is exponentially more competitive. Our Conical Tapered Carbide end mills feature advanced variable geometries to reduce harmonics, increase speeds and feeds and improve cycle times. 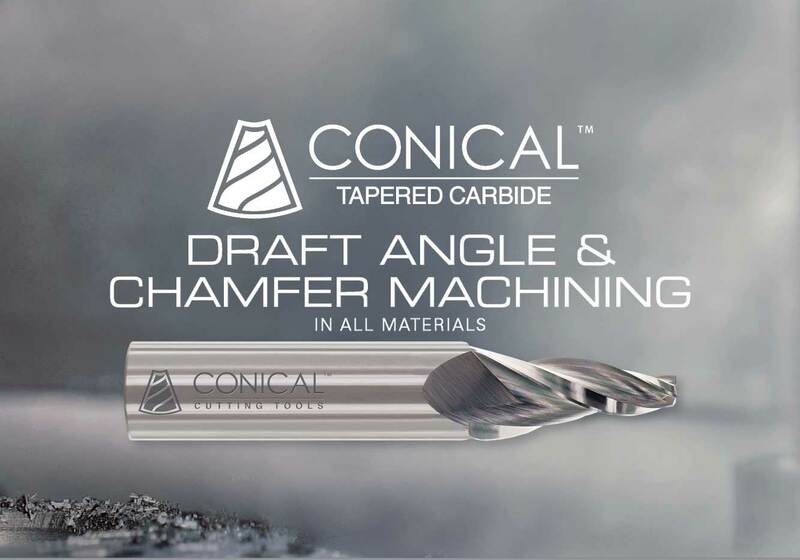 Whether you need to finish sharp corners, contour mill with clearance, machine draft angles, add chamfers, finish cavities or taper holes; no one has a larger selection of in stock items, or the years of expertise, to help you select the right tool like we do.